This afternoon, we went over to the Waitangi Treaty grounds. The Waitangi Treaty marks the birth of New Zealand as a nation, so as Mike rightly pointed out, this is sort of the equivalent of the National Park in central Philadelphia where the United States were formed. It's an interesting contrast. The treaty grounds are in open countryside, with occasional homes and small communities. They are composed of a mixture of fern forest and lawns with the sea at one side. They contain two houses, the governor's house, representing the Europeans and the Whare Runanga, representing the Maori. 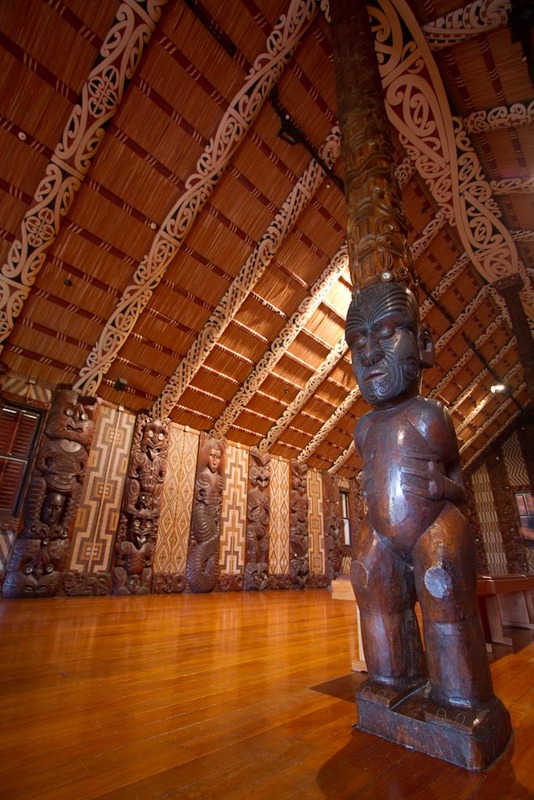 Some distance away is a large, open canoe house containing Ngatokimatawhaorua, a canoe of impressive proportions. 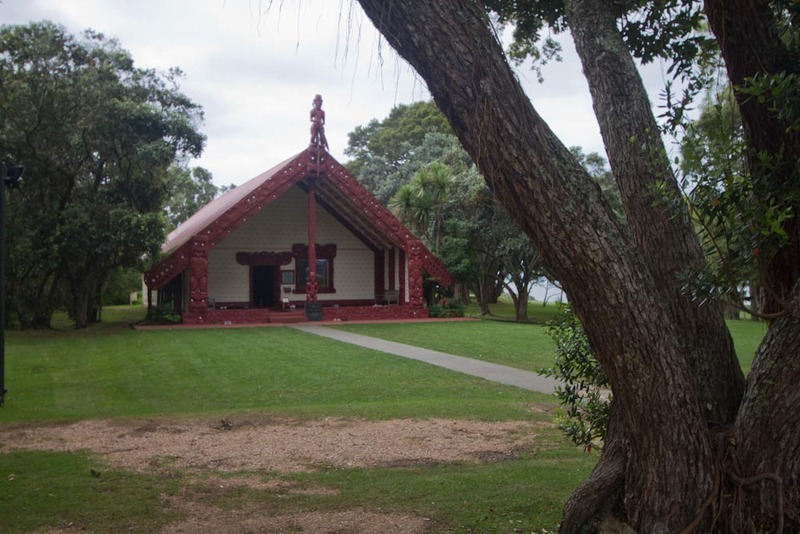 There is a small display of traditional Maori domestic architechture, a flagstaff and a visitor's centre and cafe. Antonia went to see a cultural performance of Maori song and dance and I took a guided tour that focused on the significance of Maori carvings, mostly in the canoe house and Whare Runanga. This was very interesting, and I now know what I am looking at when I see Maori carvings. The main figure almost always represents an ancestor, often the founder of a lineages. Additional figures may represent descendants in a general sense (that is, they are not named). The detailed iconography of the carving varies since it may refer to events in the ancestor's life, his or her personality or characteristics, or tendencies associated with the tribe. Of course I wouldn't know what these details meant in a carving I haven't had explained to me, but I would know what sort of things the parts of the carving would generally refer to.